Latest 2018 research is good news for olive oil and coconut oil which have had some conflicting press lately about how they could be harmful to cook with. This research provides unequivocal and definitive evidence that should finally dispel this myth. It shows that extra virgin olive oil and coconut oils are not only safe during heating at regular cooking temperatures, but are the desirable cooking oil when compared with others. When cooking oils are exposed to heat, oil degradation occurs, and by-products are produced (free fatty acids, secondary products of oxidation, polar compounds). Some by-products of oil degradation have adverse effects on health. There were 10 oils studied and the results were as follows: Best to worst – was extra virgin olive oil , coconut oil, peanut oil, virgin olive oil, olive oil, avocado, rice bran, sunflower, grapeseed, and finally canola. Sunflower, grapeseed and canola were particularly degraded by cooking showing high levels of polar compounds. I prefer to cook with ghee which has the highest smoke point and lowest degradation shown in other studies. Ghee can be used in place of oil. It also makes a wonderful body base oil for massage and can serve as a base for herbal ointments. Ghee is a wonderful digestive. It helps to improve absorption and assimilation. It nourishes the body and it is good for lubricating the connective tissue, it acts like an oil and lube for your hamstring muscles! 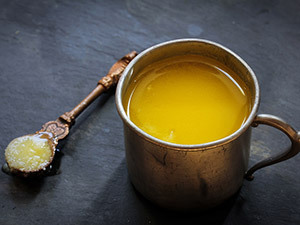 Ghee is tridoshic and is a yogavahi—a catalytic agent that carries the medicinal properties of herbs and food into the seven dhatus or tissues of the body. Ghee pacifies pitta and vata and is acceptable, in moderation, for kapha. Ghee and good oils are also an excellent source of fat for your brain and memory enhancement. Good fats that provide both saturated fats and omega-3 fatty acids (EFAs) are essential for a baby’s brain development in the womb and continues throughout the entire life. In fact, your brain is mostly made up of fat! Recent studies have shown that a lack of fat is a contributing factor to our high rates of dementia and Alzheimer’s. You only need to use a tspn for cooking however persons who already have high cholesterol or suffer from obesity should be cautious in using ghee. Turn down the heat until the butter just boils and continue to cook at this heat. Do not cover the pot. The butter will foam and sputter while it cooks. Whitish curds will begin to form on the bottom of the pot. The butter will begin to smell like popcorn after a while and turn a lovely golden color. Keep a close watch on the ghee, as it can easily burn. After a while it will become a clear, golden color. You will have to take a clean, dry spoon to move away some of the foam on top in order to see if the ghee is clear all the way through to the bottom. When it is clear and has stopped sputtering and making noise, then it needs to be taken off the heat. Let it cool until just warm. Pour it through a fine sieve or layers of cheesecloth/muslin into a clean, dry glass container with a tight lid. Discard the curds at the bottom of the saucepan. The ghee is burned if it has a nutty smell and is slightly brown. 500g of butter takes about 15 minutes of cooking time. The more butter you are using, the more time it will take.